Help the National Gallery, London, to buy a superb antique frame for Titian’s Allegory of Prudence: YOU can make a difference to the presentation of the national collection. Titian’s Allegory of prudence is a mysterious painting. It might almost be called a problem painting, by analogy with the group of ‘problem plays’ written thirty or forty years later by Shakespeare. Like those, it is ambiguous, complex, neither dark nor light, and it shifts its tone and meaning as different critics reinterpret it. 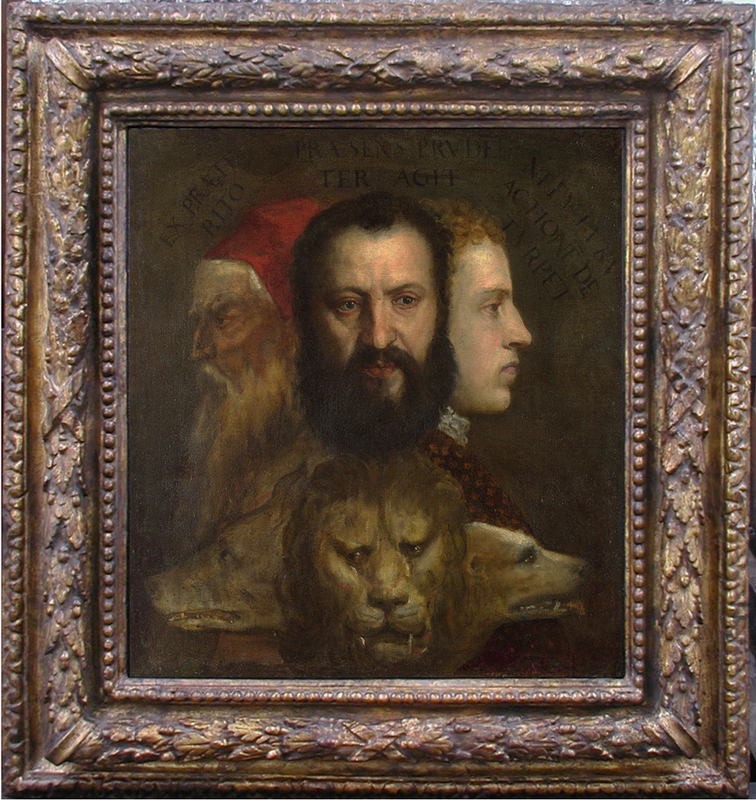 The head of the mature man in the centre, which springs like one flower of three from a single stem, is a mesmeric and powerful study of a man in the prime of life, and is agreed to be from the hand of Titian; the other two heads seem to be by different hands – pupils or workshops assistants – as do the three animals, wolf, lion and dog. In the most straightforward interpretation, this is an allegory of the ages of man – youth, maturity and old age – echoed by the animals which were supposed to embody the qualities of those ages. They may be purely generic representations, then, taken from anonymous models; however, the head of the elderly man in the red cap has been seen as reflecting the features of Titian himself. This theory is based on comparison with his Self-portrait of c.1562 in the Prado, although if this is so, his face is reflected as if in a distorting glass of pain, rage or malice. The central head under this reading is that of his son, Orazio (although it could also be the middle-aged Titian, from his self-portrait in Berlin). The young man on the right, it has been hazarded, may be Marco Vecellio, a cousin; although Nicholas Penny has pointed out the likeness of this profile to the workshop portraits of the three boys on the left of Titian’s Vendramin family, c.1540-43 to c.1550-60, National Gallery . The enigma of the painting is magnified by the inscription which curves above the three heads: ‘ex praeterito praesens prudenter agit ni futura actione deturpet’ – or, ‘out of [the lessons of] the past /the present acts prudently/lest it spoil the future by [rash] action’. This is a verbal expression of the iconographical figure of Prudence: traditionally a figure with three heads, representing the present drawing upon the experience of the past to guide the deeds of the future. It has been suggested that these triplets might also stand for the aged and remorseful Titian regretting the sensuality of his youth and the pride of his maturity, or that it may depict an artistic dynasty, with each generation learning from the one before . The ambiguity of this painting only increases its power and fascination; and the different hands apparent in its creation add further layers of interest. 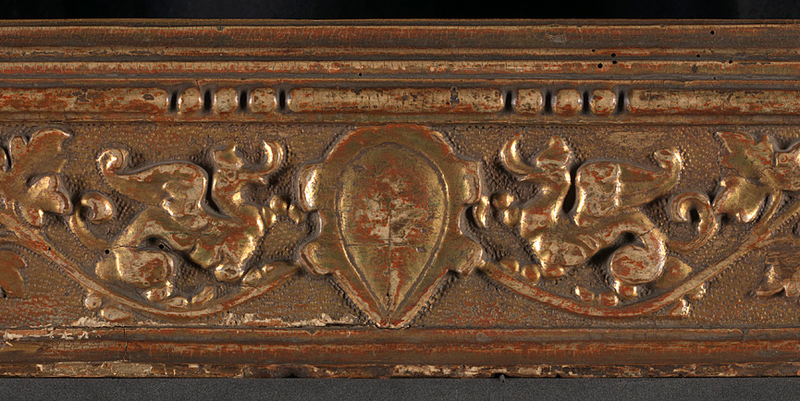 It was acquired by the Gallery in 1966, and is currently set in a 17th century French frame with three orders of ornament, the torus moulding on the frieze being carved with a bound garland of oak leaves and acorns. This setting is overpowering and distracting, closes in the composition, and detracts from the strengths of the painting. It is also of the wrong period and place; it’s a Baroque French frame, rather than Renaissance Italian, and thus unsuitable on every level for such an idiosyncratic and intriguing work. Peter Schade, Head of Framing at the National Gallery, has recently found an extremely beautiful 16th century Venetian cassetta of almost exactly the right size for the Allegory of Prudence. As you can see, it lifts the painting onto a completely different plane, revealing the sculptural qualities of the composition, opening it out from the claustrophobic darkness of the present setting, and magically illuminating the whole work. This frame – a cassetta, or ‘little box’ frame, the earliest style of moveable or non-integrated border for a picture – has a flat architrave profile, which acts like the embroidered margin of a tapestry, providing a decorative field of transition between the real world and the mysterious otherworld of the painting. This particular cassetta has a central frieze carved with undulating vines, scrolling acanthus and cosses-de-pois, or pea-pod ornament, amongst which little zoömorphic dragons play. This last detail has a fortuitous iconographical connection with the three beasts in the painting. In Renaissance symbology, animals stood for the seven deadly sins; and if the lion means superbia or pride, the wolf, aravitia or avarice, and the dog, luxuria or lust – often found in combination as the three major sins – then the dragon is mors, or the death which will swallow up all such failings . 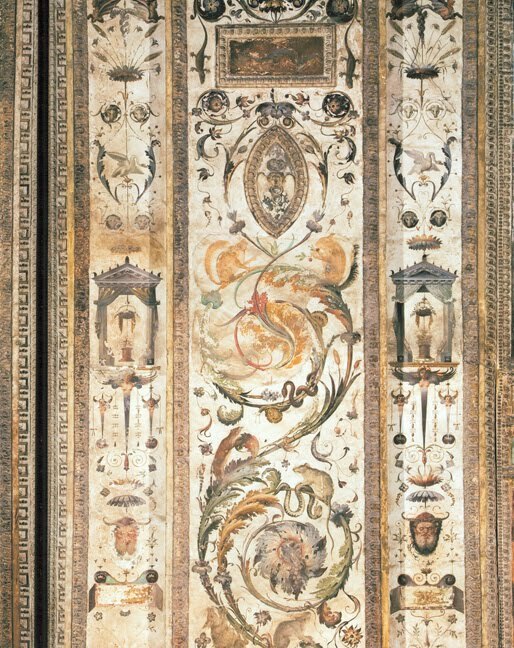 In ornamental terms, however, the dragons which grow from the vines and acanthus leaves are descended from the Emperor Nero’s Domus Aurea, or Golden House, which when excavated in 1488 was found to be decorated with fantastical painted arabesques, delicate, playful, and swarming with strange figures and beasts. Studio of Raphael, detail of Pilaster IX, with acanthus foliage populated by animals & flanking half-pilasters, 1516-17, Loggetta Bibbiena, Vatican. With thanks to Alberti’s Window. These grotesques or grottesche (from the grotto or cave for which the Domus Aurea had been mistaken) were imitated by Raphael and his colleagues for the decoration of the Loggia at the Vatican, and by this means they became extremely influential for all types of applied and decorative arts. They appear on Renaissance frames in moulded or ‘dripped’ gesso forms, painted or sgraffito panels and corner ornaments, and – as here – in carved friezes. The quality of the carving is evident from this detail; the fluent swell and curve of the main vine stem; the variegated forms of the leaves; the triumphant swoop into an S-scroll across the corner, and the little dragon, his hindquarters transforming into a honeysuckle and his front legs becoming an acanthus leaf. The gesso ground behind the carving is punched, giving textural relief, and the red bole or gilder’s clay glows through the gold leaf, suffusing the whole frame with a sunset warmth. 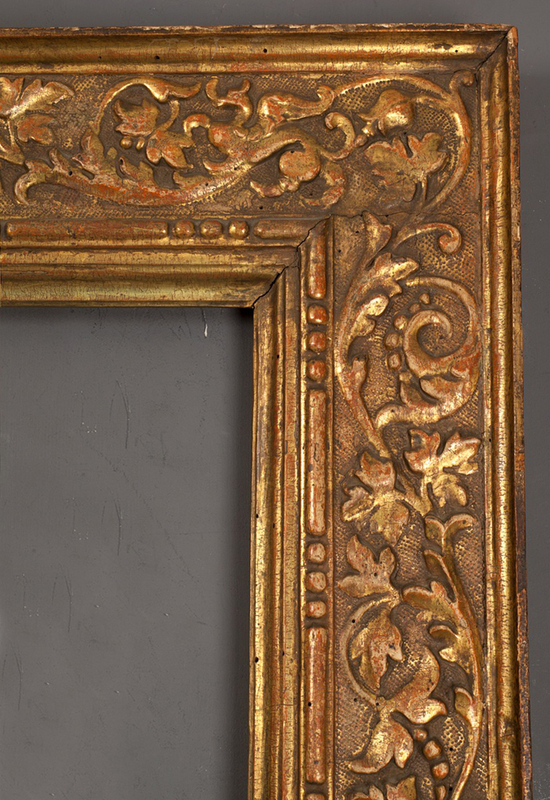 This frame would be the perfect complement to a unique and important painting. Sadly, antique frames of this quality are exceedingly rare and correspondingly not exactly cheap. £10,000 has already been raised; you can help the Gallery to find the £17,000 it still needs for the purchase to go ahead. Please help – whatever you can give would be very gratefully received, and you would have a permanent stake in the presentation of an extraordinary work of art. Update: in a press release of 11 February 2015, the National Gallery has announced that the target has been reached and the frame purchased: with thanks to the 244 people who so kindly contributed! 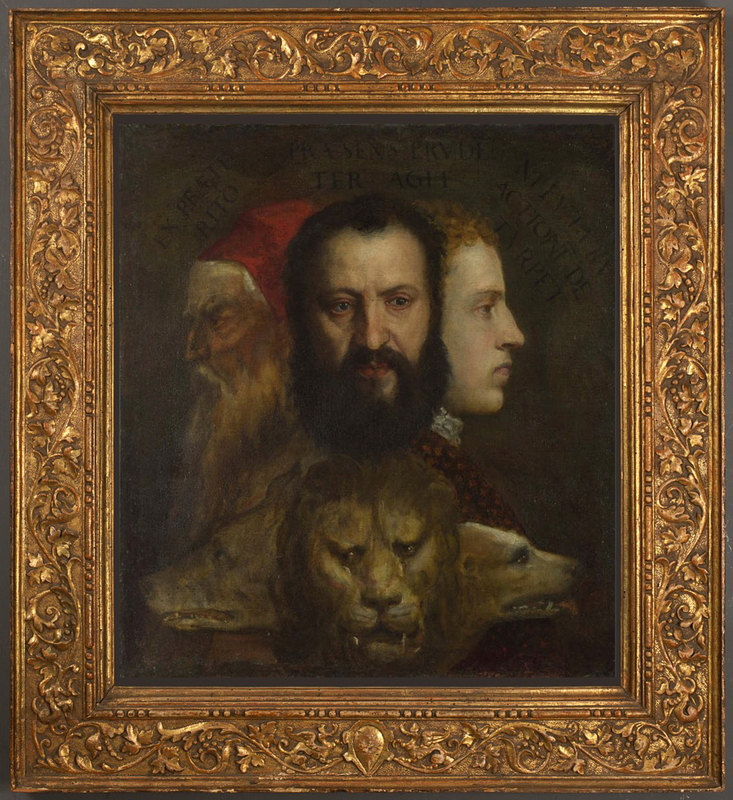 For a helpful essay on the different explanations of Titian’s Allegory…, see Philip McCouat, ‘Titian, Prudence and the three-headed beast’, Journal of Art in Society. See Simona Cohen , Animals as disguised symbols in Renaissance art, 2008, pp.225-27. The difference between the painting in the two frames is really dramatic! Thanks for sharing about this important appeal. Hopefully the National Gallery gets the needed funds soon! If only the tone of the “new” frame would be more like the current one, it would permit the viewer’s eye to see the painting first rather than the frame. Well, I can’t agree with you there; the dull, dark tone of the present frame kills the painting, whilst the soft gold and warmth of the proposed frame awakens all sorts of lights and colours in it… together, they become a complete work of art, rather than a puzzling painting in an awkward setting.